Jennifer Ichida from the Angelucci laboratory will be delivering a seminar tomorrow, February 12th at 12:00 in the John A. Moran Eye Center Auditorium. Abstract: Visual perception results from the activity of neuronal networks in the visual cortex. A major challenge in visual neuroscience is to understand how these networks compute the responses of cortical neurons and perception. The perception of a visual “figure” often relies upon the global spatial arrangement of its local elements. In primary visual cortex, neurons respond best to oriented stimuli of optimal size inside their receptive field, but that response is modulated by larger stimuli involving the receptive field surround. This surround modulation may underlie perceptual “figure-ground” segregation and other perceptual phenomena involving global-to-local computations. The mechanisms and pathways underlying surround modulation are crucial for understanding vision and visual cortical computations. 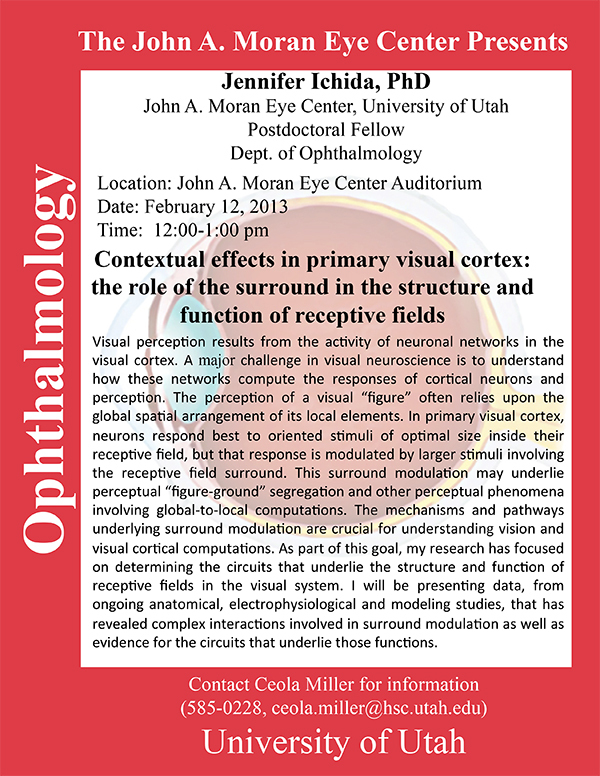 As part of this goal, my research has focused on receptive fields in the visual system. I will be presenting data from ongoing anatomical, electrophysiological and modeling studies that have revealed complex interactions involved in surround modulation as well as evidence for the circuits that underlie those functions.